University of Rochester Students Donate Clothes During Move-Out - Planet Aid, Inc.
For the sixth year in a row, University of Rochester students participated in the Move-Out, Clean-Out event at the end of the spring semester. 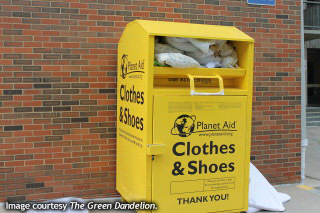 Planet Aid placed a bin outside of each residence building, collecting 10,983 pounds of clothing and shoes in total! Food, electronics, and larger dorm items were also collected to prevent them from ending up in a landfill. You can read more about the event on the University of Rochester's sustainability blog, The Green Dandelion.